The EC-3A is used to determine feeder loading and is mainly used by power distribution companies, heavy industry, facilities management, electrical or site services and maintenance engineers to monitor loading variations on site helping them to diagnose any related issues, transformer and feeder sizing problems. The EC3A is perfect for gathering data to make a case for splitting-up the loading or increasing circuit capacity. The EC-3A-xK models are designed for large loads up to 3kA versions. If you require higher inputs still then currents up to 10kA are possible. Please contact us regarding these. The Rogowski Coils fit around cables of 140mm diameter or less. The EC3A-xK uses USB communications. 2014: Now available as -RS version, with selectable ranges: 4A to 400A or 20A to 3kA. 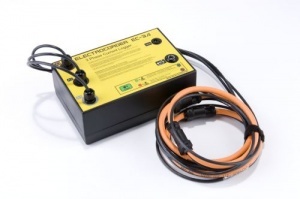 For lower currents, we recommend the CT-3A-RS (ex EC-3CT) which uses traditional clamp-on current transformers (CT's) and has selectable input ranges of 0.5 to 60A or 4A to 400A, making it accurate at lower currents, suitable for domestic and light commercial logging. Rogowski fits round 140mm diameter cables. Complete with Coils USB lead carry case & software. Sealed to IP65 or NEMA 12/4.